In 2001 I had decided to take on the DPB and started making as much fuss as I could. That included circulating my petition to the NZBR. A complete political/activist novice I rang Roger Kerr with a great deal of trepidation. It was unnecessary. Roger wasn't dismissive. He was interested and receptive though he warned that getting endorsement from members might be difficult. He wasn't wrong. To receive petition copies I had set up a P O Box. One day, clearing it, I found a large package. Given some of the very hostile letters waiting for me most days I regarded the package with some nervousness. To my delight and gratitude the package was from Roger and contained all the NZBR publications pertaining to welfare. It came out of the blue. But I understand today, with my own pathway in and out of politics and reasonably rapid realisation that influencing thinking is just as important as political power, that for Roger, sharing ideas, and especially sowing them on fertile ground, was paramount. In 2008 I approached Roger again. This time book in hand. He took time to read it, call me in and go through it page by page. It was a wonderfully self-interested free market gesture. He wanted a part of my book and I wanted critique. From that meeting came the paper the NZBR published in 2009 which led to more occasions when I would enjoy Roger (and Catherine's) company. I remember turning up for the media launch of the paper and Roger leaping forward with his typical energy, smiling broadly at me saying something like "here's the star tonight". Absolutely the wrong thing to say to an introvert like me but he meant to make me feel welcome and to give me confidence. One night during the 2008 political campaign I was called on to stand in for Rodney at a student meeting at Victoria. Roger and I took the affirmative for free trade. He was very experienced and accomplished. I was out of my league. But neither the audience nor myself was made to feel as though Roger was superior, above us, imbued with some god-given truth. Roger knew that persuasion meant honest and non-personal debate. In fact I think he was Mr non-Nasty. A rarity in the emotional arena of philosophical ideas. It is so very sad that he won't be around to continue this hugely important work for what I would have easily entertained as another 20-30 years. But mostly I feel for his and his closest's personal loss. As someone who always tries to make sense out of untimely and undeserved loss I will resolve to keep trying to persuade people to ideas that will make New Zealand a better place. Can't do it a patch on the way you did it Roger but a few of us might add up to the sum you were. The best reason for giving my party vote to ACT. “It is mean spirited to expect a person who has raised a family and paid his or her taxes to go out job seeking at the age of 66 – particularly if there are not enough jobs to go around as is the situation now." Cute. Winston is of course job-seeking at 66. Hopefully there aren't enough "jobs to go around" for him. At a time when the economy is in undeniable trouble, lifting the qualifying age for Super would save billions. But it needs to happen now and it needs to happen decisively and clearly. Labour say they want to raise the age for super eligibility to 65. In the next breath they say they will make an exception for people who can't work past 65. If someone can't work due to illness or disability they go on the relevant benefit. Why is it that so many superannuitants are happy to have their pension linked to the CPI and average wage but not average life expectancy? Got a Green's campaign leaflet in the letterbox today. It is carefully evasive by omission. Under their heading, Bring 100,000 children out of poverty they promise to "Extend 'Working For Families' so 140,000 of the poorest households with children have an extra $60 per week." OK. The policy accurately described is to extend the In Work Tax Credit to beneficiary parents. The Greens have intentionally omitted any reference to the In Work Tax Credit because most thinking people (and even the Greens want to appeal to thinkers) will immediately question the wisdom of giving a tax credit designed to incentivise work, to people who are not working. Beneficiary parents already receive WFF in the form of Family Tax Credits which are not ungenerous. Earlier this week orange ribbons began appearing on most lamposts in Eastbourne. At least, south of the shops. Initially I thought the posts were being marked for some sort of maintenance. Then, walking dog, I noticed the same ribbons had been tied to the railings that go over the steps at the esplanade seawall. At which point I figured it was some sort of stunt. 2 days later plaques sporting whatzone.co.nz began appearing over some of the ribbons. Well, I thought, someone has gone to so much trouble to get my attention, it would be churlish not to do what they want me to. Any ideas as to what this is about? Anyone more imaginative than me want to take a stab? Not some bureaucratic council zoning according to tsunami threat I hope. Labour has apparently just announced policy to raise the eligibility age for Super. So ACT and Labour agree on a major issue. ....Trevor Mallard is unfortunately my MP so I take an especial interest in his blog. Now check out Trevor's Blog. 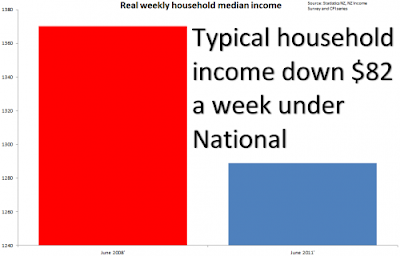 He has the figure at $1,371 and writes about National, "After just three years, they’ve managed to slice $82 a week off the income of the typical household." The graph should clearly indicate that the data has been adjusted. - In 2010/2011, we received 150,747 Care and Protection notifications. This is an increase of 20.7 per cent from 2009/2010. The increase was due, in part, to the number of family violence referrals from the New Zealand Police and the greater visibility of child abuse in the community. - The number of substantiated abuse/neglect cases within six months of previous abuse/neglect finding increased from 1,797 in 2008/2009, to 2,253 in 2009/2010, to 2,509 in 2010/2011. - The rate of substantiated abuse/neglect within six months of previous abuse/neglect finding increased from 2.21 per 1,000 children aged 0–16 years in 2009/2010, to 2.48 per 1,000 children in 2010/2011. If more children are safe MSD must believe that they have only previously detected and dealt with a small portion of those who are either abused, neglected or at risk. Can we have some policy like this please? Rick Perry is a Republican, is the governor of Texas and a candidate for president. Read his plan for the US here. Flat tax, tax exempt income to $12,000, spending cap for federal government set at 18% of GDP, a ban on bail-outs......and Texas is not the basketcase other US states have become. Texas has a small government, with a legislature that meets for only 90 days every two years. Taxes are low and there is no state income tax. As a result, its economy thrives as large and small businesses generate new jobs. Unemployment rates have been below the national average for more than a decade. In spite of weak state sector unions, public services are said to be superior, with education test scores higher than those in many other states. Americans have been voting with their feet and moving to Texas at double the rate of any other state. Texas is also a magnet to families from abroad, who are attracted by a small, low-tax government that encourages creativity and opportunity. 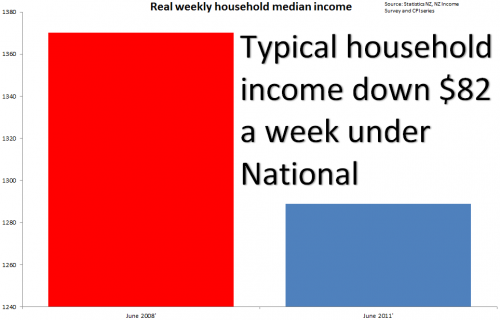 Today Mallard has graphs which show falling median incomes since National was in government. He has used the NZ Income Survey June Quarter 2011. Ethnicity appears at Table 4. The figures are actually as follows. Total (what Trevor calls 'typical') weekly median income from all sources rose from $536 to $550 between June 2008 and June 2011. It didn't drop by $35. For Maori it dropped by $40 and Pacific $65. Not $85 and $106 as depicted in Trevor's graphs which incidentally use the same scaling trick as yesterday. Trevor has used inflation adjustment to 2008 figures to arrive at his considerably bigger differences eg what was $536 (according to the NZIS) in 2008 he has transformed into $585. Now I don't claim any knowledge about how inflation adjustment is done. Perhaps a reader can make comment. But what does occur to me is that those median income figures are inflation-proofed to some degree as superannuitants and beneficiaries have their incomes annually adjusted for the CPI. That's around 900,000 incomes. I can't get my head around the implications of this in further adjustments. Perhaps the drops over the period would be even greater. Incidentally unadjusted Asian incomes rose by $61 over the same period. I wonder if he is going to produce a graph for that group? CPAG lose case - Labour lose too? Thanks to Bob McCoskrie for sending me the decision of the High Court in relation to the Child Poverty Action Group (CPAG) case appealing an earlier Human Rights Tribunal decision upholding the right of government to discriminate between working people and beneficiaries. Their conclusion finds, "...the discrimination caused by the exclusion of beneficiaries from the In Work Tax Credit is demonstrably justified. it follows that CPAG is not entitled to the declaration of inconsistency sought." Looking for the political ramification it strikes me that Labour will be frustrated by this decision albeit the IWTC was originally their policy. It would have suited Labour, whose campaign is expediently 'child-centred', to join the other parties whose policy it is to give the IWTC to beneficiary parents - Mana, Maori and Greens. A High Court finding of unjustified discrimination would have paved the way to a reversal. Trevor Mallard has two graphs comparing unemployment benefit numbers when National took over and September 2011, and unemployment numbers over a similar period. Putting aside the international recession which has seen the unemployment rate rise significantly but not as badly as in many other developed countries - the OECD Europe average is 9.2 compared to NZ's 6.5 - Trevor couldn't resist mucking about with the scales to create a misleading impression. The first starts at zero and the second starts at 75,000. For the record the deleted balance consisted of, Oh silly me. That was your intention. The Greens campaign slogan is Vote green for a richer New Zealand - or something like that. • Set benefit amounts at a level sufficient for all basic needs of the individual/family. • Protect all benefit levels by linking rates to a fixed percentage of the average wage (like superannuation). • Replace the current Social Security Act 1964 with a simple two-tier benefit system consisting of a universal base rate that is enough to live on, with add-ons for specific circumstances, such as dependants, disability or chronic illness. • A Universal Child Benefit of $18.40 per week per child for the first child, $13.00 for subsequent children, with the ability to capitalise it towards a home deposit. • Abolish stand-down periods, treat people aged 18 and over as adults for benefit purposes; no forced work for the dole. • Support urgent Government action to address the problem of benefit abatement for those moving into employment, and the removal of the poverty trap created by high marginal tax rates that exist for people on low incomes. • Introduce a tax-free zone at the bottom end of the income scale. • DPB to be protected; no compulsory work-testing. • Appropriate training, vocational advice and support for sole parents. • Remove discrimination from tax credit regimes such as the In Work Payment component of Working for Families. • Support an allowance to beneficiaries who carry out a minimum number of hours of voluntary work per week. • Improve the culture of Work and Income so that people are treated with dignity and respect and are enable to access their full entitlements promptly. Spending billions more on welfare. One of the reasons NZ has gradually become poorer than other developed-world countries is the loss of productivity through welfare dependence. Voting Green, and getting these policies, would make NZ even poorer - not richer, in any sense of the word. And though I don't think we will get them, a bevy of parties together - Maori, Mana, Green, and Labour - are pretty much in the same ballpark on welfare. If ACT goes the election result could be much, much tighter than predicted. Just like that game last night. Just added a link to Eternal Vigilance authored by friends Tim Wikiriwhi and Richard Goode. Both Libertarians but not Libertarianz. Being Christians they were rejected by Objectivist Libertarians. I always thought Libertarians were about live and let live. I wouldn't deny someone their faith. It mightn't be for me but I abhor anti-religionism when it takes on all the fanaticism of some religions. Richard is standing for the ALCP in Mana and Tim is standing as an Independent in Hamilton West. Good luck guys. I admire your courage and conviction.